When I wasn't working back in March(been back to work now),I cook a lot more for my husband.Previously because my work sometimes last up until 8-9pm(depending how urgent an ad campaign is),I rarely have the time to cook for him during weekdays. Nowadays since I'm back to work, it's the same thing as well. I tend to cook 2-3 days out of the 5 working days. The problem is that..sometimes there will be days when you tend to be blur on what to cook because you don't want to cook the same thing all the time(mine tends to be cereal/butter milk/salted egg prawn or squid).So i'm always trying out new recipes from the internet and alhamdulillah,they always turn out well. It helps that I actually love cooking and baking.When I cook,I have to cut up all of my ingredients and put them in separate bowls/containers.I love to organize the ingredients that I'm cooking with because it's easier that way. Also,whenever I cook dishes to go with rice,I just can't cook one dish..it just seems incomplete.I have to cook 2-3 dishes and one must have vegetables in it..or a vegetable dish. I love ayam masak kunyit from this food truck that sold it near my previous work place.Since we had lots of prawns that day,I made udang masak kunyit instead.It's so easy to make and so tasty.My husband loves to order Nasi Goreng USA whenever we buy takeout food from this stall near our house. So I thought,why not try and replicate the recipe.It's super easy and tastes so good.I used beef sirloin (daging batang pinang)for the dish so the beef just melts in your mouth.But I didn't use any food colouring for this dish though.When you buy it outside,they usually marinate the beef in red coloring because the name of the dish is daging masak merah(cooked red beef). I had this fried tofu salad from this restaurant called Zainab at PJ Old Town and I love it!So I thought that i'd replicate it at home.Sooo yummy and easy to make!I didn't use any specific memory and just agak2. Firm tofu --cut in thin strips & then deep fried until golden brown. Thai cili sauce--I used Kimball's and squeezed 1 to 2 limes and mix it together for the dressing. Layer the fried tofu on a plate.Put the sliced vegetables on top and drizzle the dressing on top.Super easy and yummy! Pulut durian is one of my favourite desserts.I made this dessert because the durian that I bought wasn't so sweet.It's reallllyyy simple.Just throw everything in a pot and mix it together on the stove.And I use the rice cooker to cook the pulut(glutinous rice). Ayam paprik is another dish that's famous when you go to any Malay goreng2 food stalls.I decided to cook it for lunch one day and it was super easy and yummy.That kaffir lime leaves just add a kick to it. I love udon!Especially that outlet at Aeon Shah Alam,the one near Daiso(can't remember it's name). So I tried to make my own udon and it was a success. You can just buy the dry udon and udon soup mix from Aeon supermarket. For the inari(the sweet fried tofu) you can use this recipe. The best thing about the udon that I love to eat outside is because of the onsen egg. I love onion rings but the one using whole onion and not the diced ones! It's actually super easy to make. I don't remember which recipe I use but i made a batter, dipped the onions which has been soaked in milk, and then roll them in breadcrumbs. It's tedious but so worth it! I love cooking vegetables lightly..so that they still remain crunchy and green. I don't like it when people cook vegetables too much and they're 'dead' or limp/soggy. I love how my green beans looked in the picture above. Hubs and I love eating fish. But I believe the picture above was for dinner with his family..or was it lunch. I made the tiga rasa ( three flavours) sauce to go along with it and also salted egg butter prawns ( so rich & decadent!). Mee rebus is a dish that I don't cook often because its laborious. 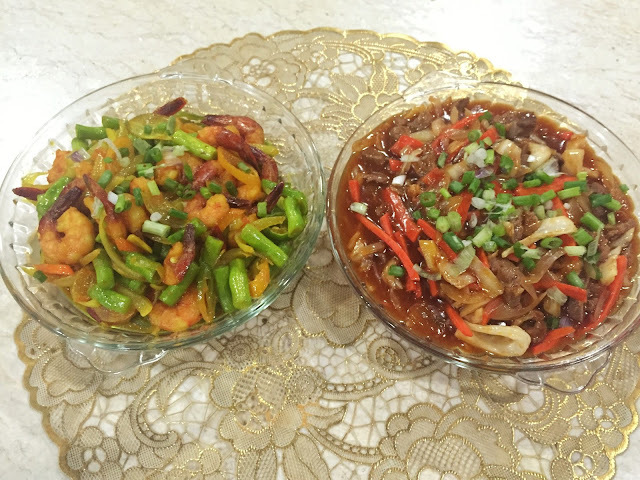 But it's so delicious and it's recipe that I learnt from my late grandmother. There's so many components in it which makes the broth so flavourful. And you gotta have those crispy homemade cucur udang to go along with it. Thinking about this dish just makes my mouth water. 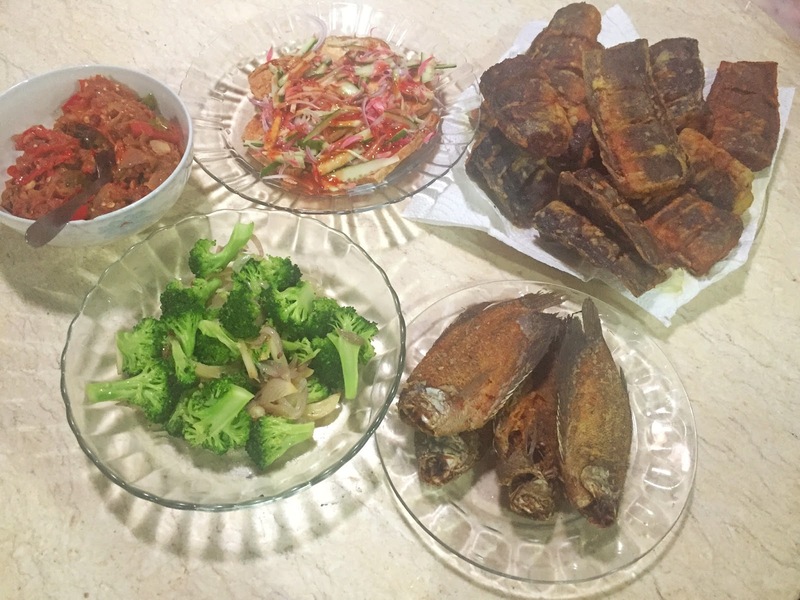 Cereal prawns,omelette,stir fried broccoli and fried fish! I loveeee cereal prawns. They're so simple to make and is very tasty! 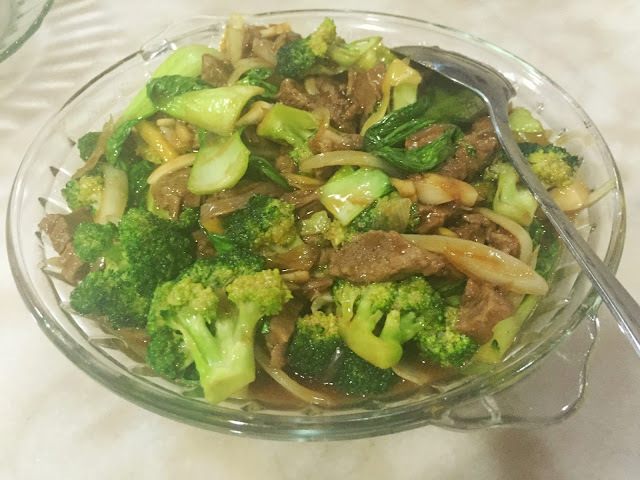 Broccoli is one of my favourite vegetable and it's so good for you. Lovely yummy (´°ω°`) I´m hungry now, haha.